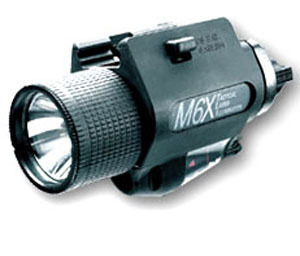 The Insight M6X Tactical Light with laser features a Xenon bulb that delivers a bright 125+ lumens, powered by two CR123 included lithium batteries, providing 1 hour of continuous light. This light is protected by an advanced shock suppression system to prevent bulb failure from heavy recoil shock from modern tactical weapons. Two position, ambidextrous rocker swith gives you momentary on or constant on and a four position swith to control the light/laser combination you want. Will fit pistols with 1913 tactical rails. Please refer to the FIT CHART to find the correct application.